Shower Enclosures are available for every budget. Full height glass cubicles can be very expensive, but there are many ways in which to approach achieving the result without the cost. Bathroom size can often appear to restrict ambitions, but the variety of Shower Enclosures that are available will allow you to utilise space effectively. The Design range of Simpsons Enclosures, including this one at less than £200, have engineered to produce an almost frameless cubicle. The result is a range of modern enclosures that sit on low profile trays. 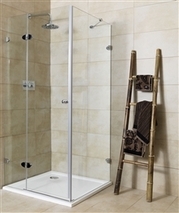 The Cascade Square Shower Enclosure including Shower Tray is modern and fashionable. The chrome and glass design provides a full length option for a tiled floor area. At less than £590 the Mirabella Frameless Square Shower Enclosure provides a feature that remains compact, with sturdy glass and shower tray. 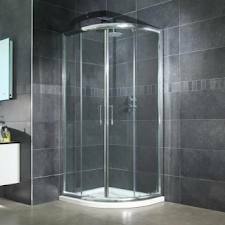 Wickes, B&Q and Screwfix Direct almost always have deals for this sort of Shower Enclosure. Often as low as £120-£160 in price.